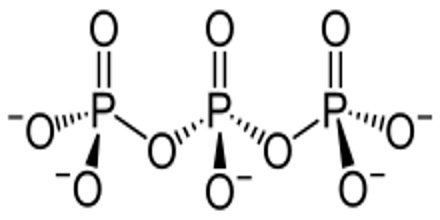 Polyphosphate is a type of salt or ester of polymeric oxyanion formed from tetrahedral PO4 (phosphate) structural units connected together by sharing oxygen atoms. Polyphosphates can have linear or cyclic ring structures. A variety of polyphosphates find application in mineral sequestration in municipal waters, generally being present at 1 to 5 ppm. GTP, CTP, and UTP are also nucleotides important in the protein synthesis, lipid synthesis, and carbohydrate metabolism, respectively. Polyphosphates are water purification chemicals that are employed to correct problems caused by inorganic groundwater contaminants (iron, manganese, calcium, etc.) and also to preserve water quality in distribution systems. a clear, crystal-free fluid that remains stable within a wide temperature range and stores well for long periods. 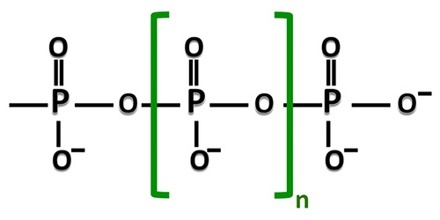 Polyphosphates arise by polymerization of phosphoric acid derivatives. The process begins with two phosphate units coming together in a condensation reaction. The condensation is shown as an equilibrium because the reverse reaction, hydrolysis, is also possible. The process may continue in steps; at each step another PO3 unit is added to the chain, as indicated by the part in brackets in the illustration of polyphosphoric acid. P4O10 can be seen as the end product of condensation reactions, where each tetrahedron shares three corners with the others. Conversely, a complex mix of polymers is produced when a small amount of water is added to phosphorus pentoxide. Polyphosphates provide many functions including the sequestering of iron and manganese and with the alkali earth metals such as calcium and magnesium. Each type of polyphosphate exhibits a different reactive sequestering rate for each of these metals/minerals. Polyphosphate also cleans or dissolves precipitated mineral scale that already exists in water distribution lines. 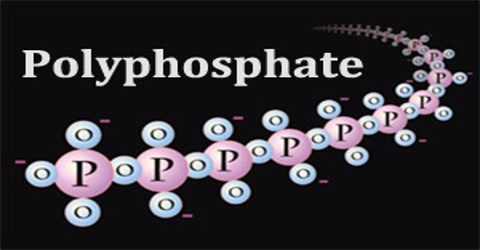 Hexametaphosphates (polyphosphate) inhibits scale formation caused by calcium and magnesium through sequestration and crystal growth modification at a rate 20 times more effective than the pyrophosphates. However, the pyrophosphates can sequester iron and manganese at a rate 16 times more effective than the hexametaphosphates. Polyphosphates were one of the first chemicals used as corrosion inhibitors and later as chromate substitutes. 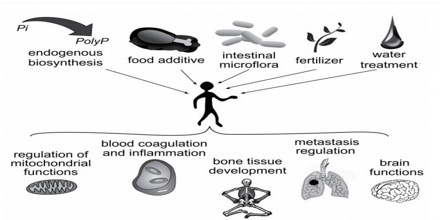 Phosphate is an essential component in plant, therefore human, nutrition. Polyphosphate is an approved additive for food and requires no special handling precautions. Widely incorporated as a flame retardant on many products, including wood, paper, fabric and plastic, polyphosphate also functions as a commercial retardant for forest fires via the role its ammonium content plays in forming a protective charred layer after burning, thereby preventing further ignition. In water treatment general orthophosphate and polyphosphate are used. They may be used either alone or mixed together to stabilize water quality and minimize corrosion in drinking water systems. Reference: cropnutrition.com, sperchemical.com, corrosionpedia.com, wikipedia.